I think we all enjoy to see a little chaos and destruction… it’s just human nature. With that in mind, I started thinking of the best things to see broken or smashed, preferably tossed off of skyscrapers like David Letterman used to do on his talk show. Perhaps he still does. I don’t know, I’m usually passed out by then, dreaming up these wonderful articles! One of the greatest scenes in media history is to see a chandelier fall from great heights, splintering into thousands of pieces when it comes to hit the floor below. When it falls on top of a person, the stakes are raised even higher. Of course, the most famous crashing chandelier has to be from Phantom of the Opera, when the ghastly Phantom sabotages the opera’s chandelier, wreaking havoc as only he can. On my most recent cruise vacation, I was mere minutes away from actually getting to see this remarkable moment. When our group showed up for the traditional formal dinner and champagne waterfall, all we were treated with was cruise staff cleaning up the wreckage of shattered glass. Apparently the ship had titled just a little too much and down came the pyramid. While people starve to death around the world, prop comic Gallagher started a revolution, smashing perfectly good to eat fruit in the name of entertainment. His ‘Sledge-O-Matic’ mallet became legendary and with every swing, audiences ate up (sometimes literally) the results of his destruction. I’m salivating over the watermelon and the thoughts of the things I could do with my own Sledge-O-Matic. Do you think it would work for muddling!? These beastly vehicles are supposed to be practically indestructible. That doesn’t mean we can’t have some fun trying to wreck them to the nth degree! I think the dude (known as Tank Man… what a wicked name!) from the infamous Tiananmen Square Massacre, who stood defiant in front of the tanks going to break up the student protest, should be our leader, gaining further vengeance on the machine he seems to have some sort of ominous power over. 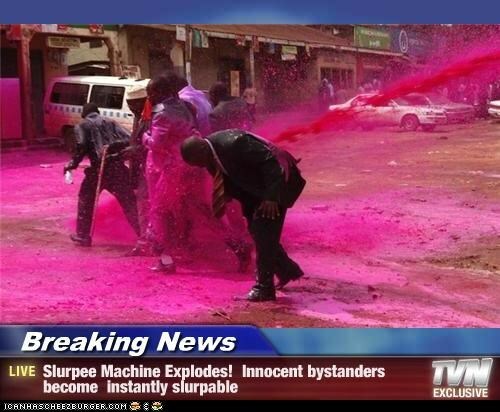 I can only imagine the rainbow that would be painted if a fully stocked (we’re talking all eight flavours) Slurpee machine was dropped from extraordinary heights onto the hard cold ground below. Would you be willing to drink whatever concoction was formed by the carnage? I would certainly give it a shot, providing I could dump a little liquid sunshine into the mix, in the form of a high-alcohol spirit! Most people say that their family dinners turn into complete nightmares when people start drinking and yapping and stirring up old issues. I say to hell with the dinner, let’s just take the whole shebang and toss it off a rooftop. Imagine the delight of passersby having to dodge gravy, stuffing, mashed potatoes, and the big bird itself. Sounds like a ton of fun to me and a wonderful way to give back to society! In a similar vein to the turkey dinner above, a tradition at Ma and Pa Sip’s place is to get rid of the ol’ Christmas tree and Halloween pumpkins by launching them off the front balcony. One year, Mrs. Sip took part in the pumpkin ritual and when she asked if she was supposed to get it in the garbage can below, I wise-assedly said “uh, no”. The result was a pumpkin hurled directly at Pa Sip, who had to react quickly not to be victimized by his future daughter-in-law. Surely, there are items I’ve neglected and you should let me know of my egregious errors. Take me to task. Make me atone for my transgressions. I dare you… no, I double dog dare you. Yeah, it’s that serious! I remember serving this drink at one of the first family functions I bartended and it didn’t go over great with most people… even those who have a fondness for Sambuca. Still, I was willing to try it again. 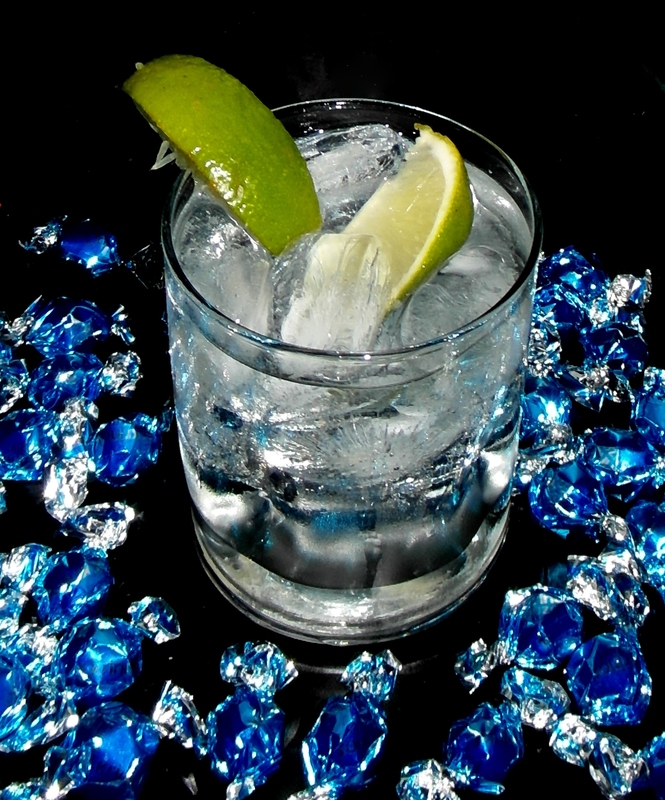 The sour from the Soda and Lime Wedges compliment the sweet and licorice taste of the Sambuca. I don’t think this cocktail will work for everyone, but for my acquired palate, it was enjoyable. This entry was posted in Crazy & Classic Cocktails and tagged 7-11, Champagne Waterfall, Chandelier, Christmas Tree, cocktail, Cracked Chandelier, David Letterman, Gallagher, lemon-lime soda, Licorice Candies, Phantom of the Opera, Pumpkin, sambuca, Slurpee Machine, smashed objects, Tank, Tank Man, Tiananmen Square Massacre, Turkey Dinner, watermelon, White Rum by Daniel Wilson. Bookmark the permalink.